Cartagena, Colombia is the most visited city by tourists in the South American country. And it’s easy to see why. From the vibrant atmosphere of the walled city to islands, beaches, and deliciously fresh seafood, Cartagena is an incredible cultural experience. But to truly appreciate Cartagena for what it is, there are a few important things to know about the city and the country of Colombia. We had many questions about Cartagena before we went, and have gotten many more from others since our trip. So we decided to write a Cartagena travel guide in hopes of answering all of those questions you may have when planning your trip. Here are a few Cartagena, Colombia travel tips and things to know about Cartagena before you visit. Perceptions of the city of Cartagena, and the country of Colombia for that matter, have been somewhat tainted by a sketchy past. For decades, Colombia was known as the home of drug lords and guerrilla warfare. As recently as 2017 even, the Colombian rebel group known as the FARC (Revolutionary Armed Forces of Colombia) was still operating as an armed militia in parts of Colombia. But a lot has changed, even in a short time. Although there are still rebel groups in Colombia and the country is far from perfect, for the most part the FARC has voluntarily disarmed and is now transitioning and reforming itself into a legal political party. Although there are still parts of the country where drug trafficking and guerilla crimes occur, Cartagena is generally not one of them. As a destination on the rise and one with such a blemished past, understandably people often have a lot of questions about traveling to Colombia. 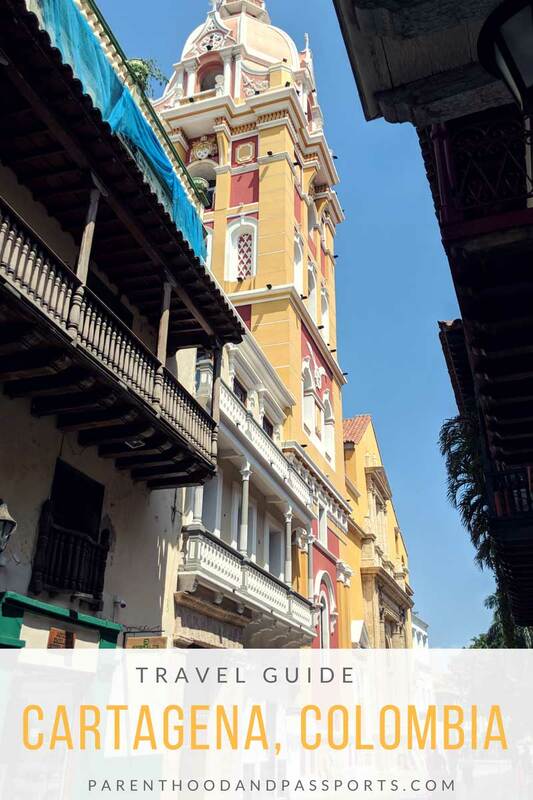 This Cartagena travel guide aims to answer all of the top questions people have about the city and shine light on a few other things to know about visiting Cartagena. I always recommend researching any country or city before you visit. You’ll find there are a lot of interesting facts about Colombia other than its infamous drug ties. Safety in Cartagena, Colombia is probably the one thing most people still question the most. As I mentioned, in the 1980s and 1990s the country had a bad reputation for being a violent, murderous, drug-ridden place that tourists wouldn’t dare venture. The deep-seeded criminal past that has given the country a bad rap will taken years – even decades – to overcome. Many people still worry about safety in Colombia. But the city of Cartagena is generally safe for tourists now. Besides a few aggressive vendors trying to scam you, and occasional petty offenses like pickpocketing, crime in Cartagena isn’t all that bad. It definitely isn’t the violent place many people still believe it to be. What is with all the freaking vendors?! It isn’t necessarily criminals but extremely pushy vendors one should look out for in Cartagena. In every tourist city, you will find street vendors trying to make a buck. I’ve come to expect it when traveling, and it usually does not bother me. But in Cartagena, it kind of did. You will be constantly hounded by vendors. You will be approached and hassled time and time again by people on the street trying to sell everything from bracelets to tours and excursions. After saying “No, gracias” about 4,000,000 times in one day it became extremely annoying. The vendors almost ruin the experience of this beautiful city. Be firm with them. Say no without even smiling. Tell them “no tengo effectivo” which means “I do not have cash” and they will leave you alone. But if you do want to shop and buy something from the street vendors, be sure to negotiate. The initial price isn’t the final price. Can you drink the water in Cartagena? Tap water in Cartagena, Colombia is considered safe to drink. But like the water in most of Central and South America, I still don’t recommend drinking it. We brushed our teeth with the tap water, and consumed drinks that had ice made from tap water, and did not have any issues. However, when we drank water, we stuck to bottled water only, which is inexpensive and easily accessible everywhere in the city. Most people from developed countries have sensitive stomachs. Variations in water treatment can easily cause stomach problems that will ruin a trip. I, for one, get tummy issues very easily when we travel (Apologies for the TMI). But if you have a strong stomach and rarely get sick, you will probably be fine drinking the tap water in Cartagena, Colombia. What’s the weather like in Cartagena, Colombia? When is the best time to visit? Cartagena is ridiculously hot and humid. It was so hot that we would change clothes every afternoon and put on dry clothes because our morning clothes were drenched in sweat. You will find yourself guzzling water religiously just to replace the bodily fluids you will inevitably sweat out while sightseeing. Although I warn against drinking the tap water in Cartagena, I strongly recommend drinking a lot of bottled water. 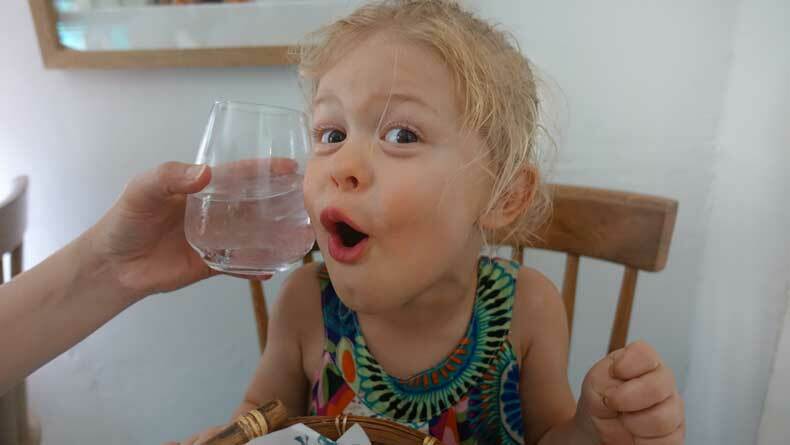 You will want – and need – to drink A LOT of water while you are there just to stay hydrated. 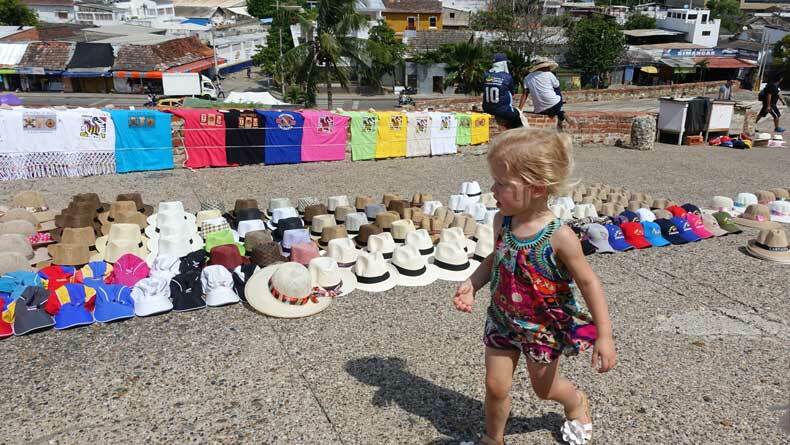 Sunscreen, sunglasses, and a protective hat are also valuable items to bring with you to Cartagena. Cooling off after a morning of sightseeing. December through April is known as the dry season and is typically considered the best time of year to visit Cartagena, Colombia. The rainy season in Cartagena falls between May and September. However, don’t write off the rainy season. You might experience pop up showers in the afternoon, which might actually cool things off a bit, but typically it does not rain all day every day during the rainy season. Which beach should you visit in the Rosario Islands? A trip to Cartagena, Colombia wouldn’t be complete without a visit to the beautiful Rosario Islands. The islands are known for their relaxing beaches and warm, clear water. Playa Blanca on Island Baru is the most popular beach in the Rosario Islands. 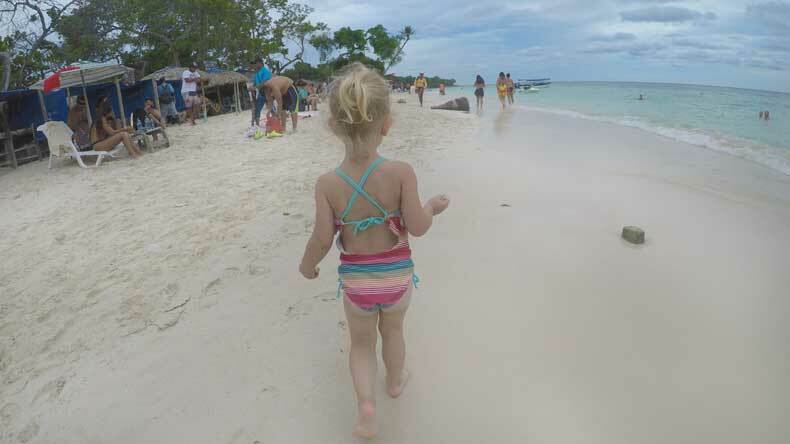 Although it is accessible by land, many visitors to Cartagena get to Playa Blanca by boat as part of a paid (aka pricey) tour. But before you book your excursion, or consider the one-hour car ride to the beach, read this warning. Skip Playa Blanca! If you have visited any of the incredible islands in the Caribbean with their pristine beaches, turquoise water, and limited crowds, you will be seriously disappointed in Playa Blanca. It is extremely crowded, a bit dirty, and overrun with pushy vendors. We still had a good time splashing in the ocean, but I was disappointed with the beach overall. If you do want to visit Playa Blanca, you can easily take an Uber there. Our Uber driver returned for us at an agreed upon time, and we paid him cash for the return visit. Our phones did not have service at Playa Blanca and the area is somewhat remote, so make sure you work out a deal with your driver to arrange a ride back. 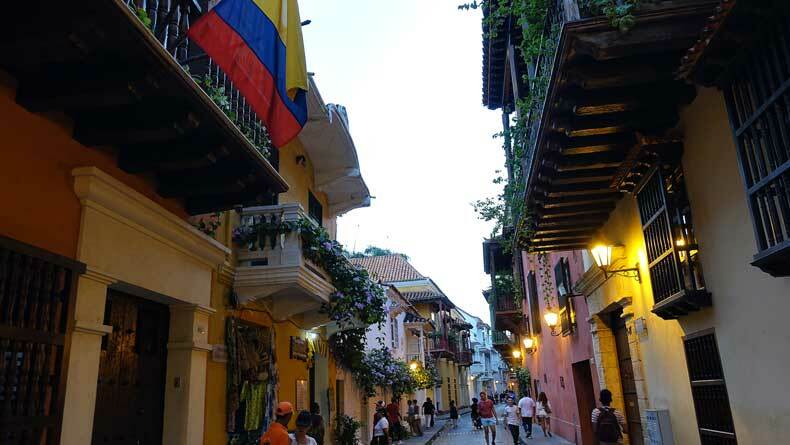 Are credit cards widely accepted in Cartagena, Colombia? Many places accept credit cards in Cartagena, but often with a minimum purchase. Small purchases like a bottle of water or ice cream will require cash. There are stand alone ATMs around the city, as well as in grocery stores and outside of banks, which makes it easy to take out cash when needed. When we travel, we tend to make a withdrawal from an ATM instead of using using the money exchange at the airport. Our bank typically gives us a better exchange rate and our transaction fees are minimal. Make sure you check with your bank before any international trip to find out what your foreign transaction fees are. Can you use Uber in Cartagena, Colombia? Uber is my go-to form of transportation when we travel in the United States. And luckily, the popular ride service is available in roughly 80 countries worldwide, including Colombia. Requesting a ride (and paying for it) through my phone was much easier than taking out money from an ATM and hailing a taxi cab. Although there are no shortage of taxis in Cartagena, I recommend using Uber if you have WiFi or an international data plan. Uber in Cartagena is both safe and easy. Is staying in the walled city worth the extra money? The short answer: yes! 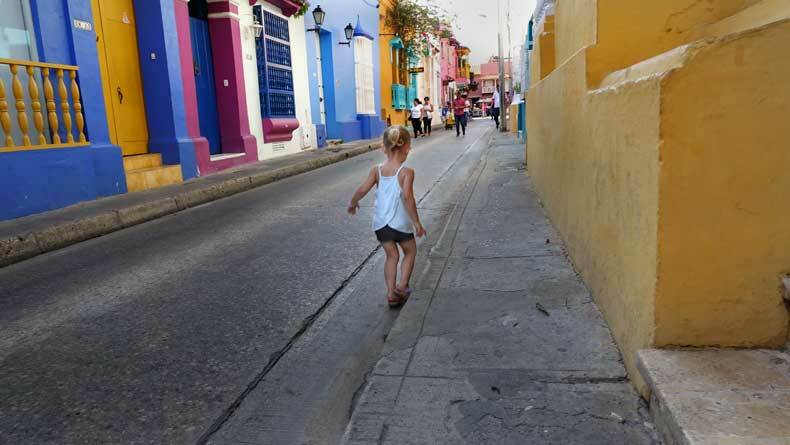 Staying in Old Town Cartagena is an unforgettable experience. It will enhance your visit tenfold if you stay in a boutique hotel inside the walled city of Cartagena. 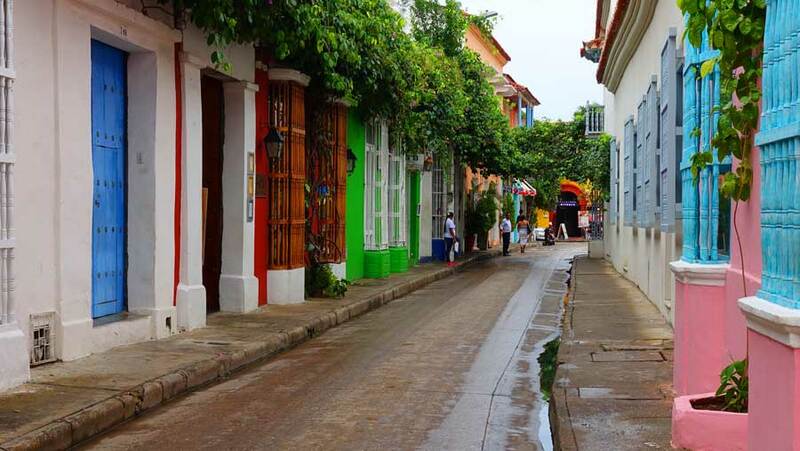 There are other areas of Cartagena in which to stay, like Getsemani and Bocagrande, but the atmosphere in Old Town Cartagena truly can’t be matched by the other areas of the city. Plus, many of the awesome things to do in Cartagena are within walking distance if you stay in Old Town. Traveling with a toddler, we are used to eating early. In fact, we are used to doing everything early. Our daughter is an early riser, which means we have breakfast around 7am. Naturally, we are all hungry again around 11am and ready for dinner by 6pm. Our toddler also goes to bed early, so this schedule works well for us. 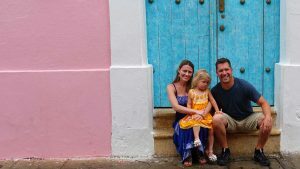 When we travel, we try to maintain a consistent schedule whenever possible, as it helps our toddler cope with jet lag and sleep better during the trip. But in Cartagena, sticking to our early routine was a bit difficult because everything seems to happen later. Many restaurants don’t even open for lunch until 1pm. And if you eat dinner early like we do, chances are you will be the only people in the restaurant. Many people don’t eat dinner until around 9pm in Cartagena. And at night, after the sunsets and temperatures drop, the city truly comes alive. What is the food like in Cartagena? No Cartagena travel guide would be complete without discussing the wonderful food in Cartagena. 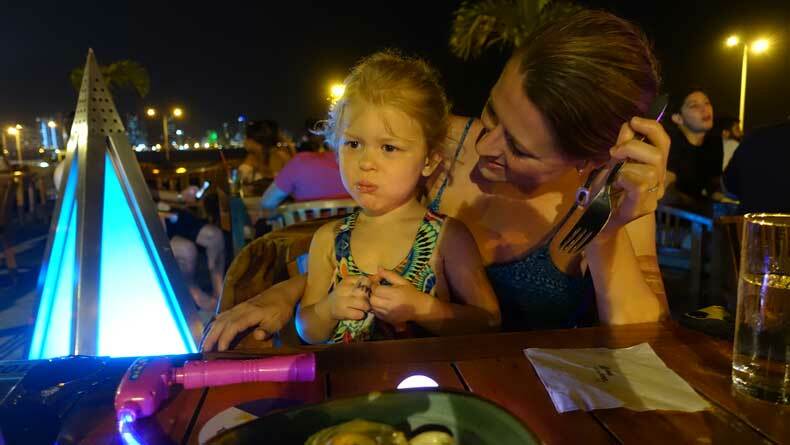 For picky eaters, you can find just about any type of food in Cartagena, Colombia. From pizza to seafood or hamburgers, Cartagena’s foodie scene has plenty of variety. If you want to experience the local flavor of Cartagena, there are a few dishes that you absolutely must try. 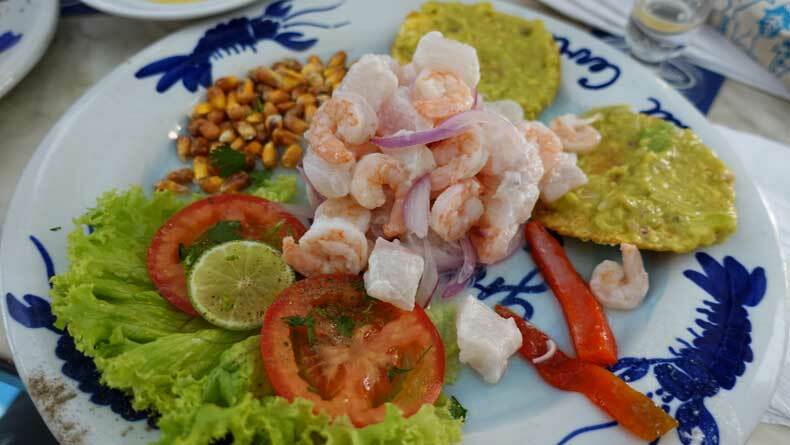 Ceviche, which is typically fresh seafood marinated in citrus juice, is very popular in Cartagena and and very yummy! 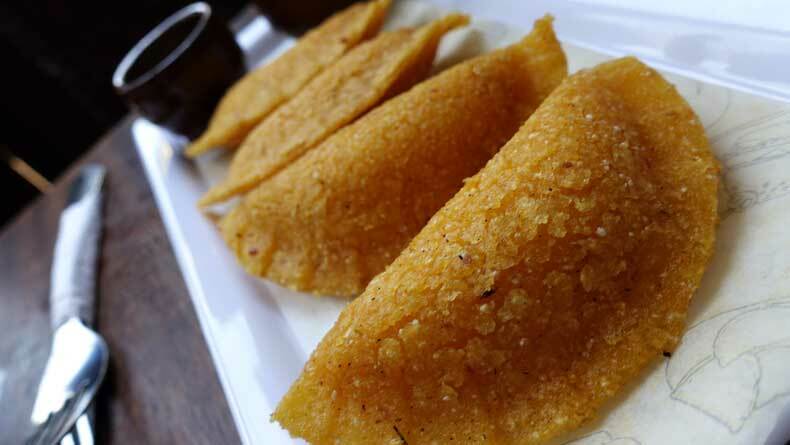 Another popular food in Cartagena is arepas, which is a corn cake filled with either meat, beans, eggs, or cheese. Of course, you can’t visit Colombia without trying coffee, one of the country’s biggest exports and the wonderful tropical fruits that you can purchase in either a grocery store or from one of the women in traditional Colombian dresses who carry baskets of fruit on their heads. 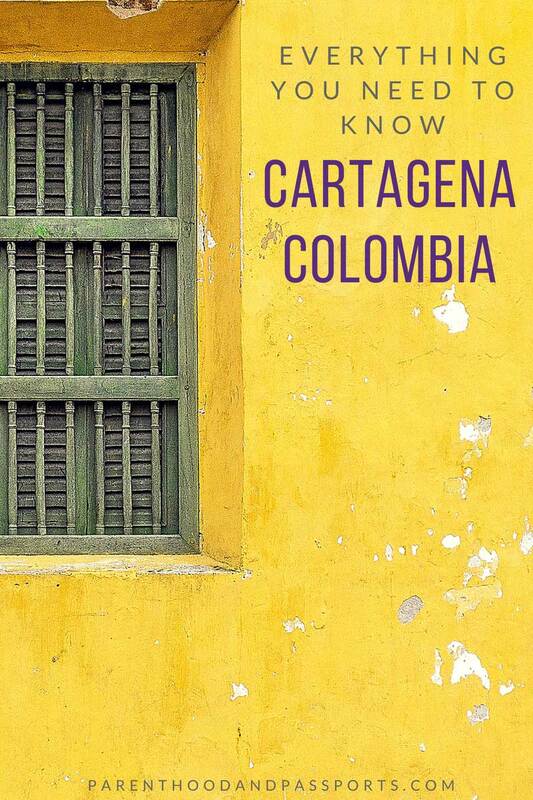 Do you have any other questions about the city that our Cartagena travel guide doesn’t cover? Or if you’ve been to Cartagena, what tips for first-time visitors would you offer? We’d love to hear from you. Leave your thoughts in the comments below. ← Where to stay in Cartagena: Old Town, Getsemani, or Bocagrande?